It's been a little while since I've shown any progress on this, and I was honestly expecting to be done by now. 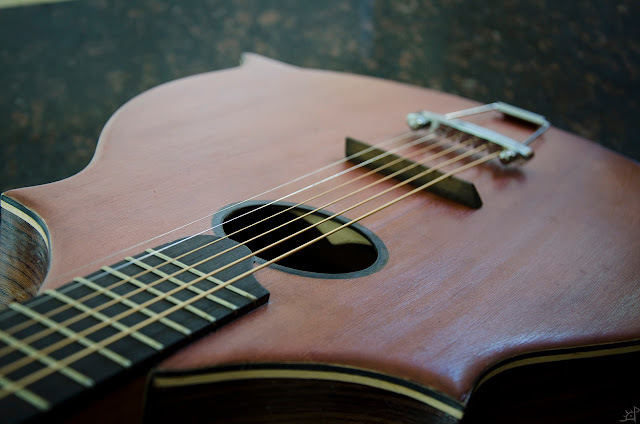 This was intended to be the final post, but due to the back order of the material for inlay on the fretboard, it may be some time yet before that has arrived. Between then and now, I also decided to try out some amplification options (since it was originally going to be purely acoustic) so that will be coming at a later time as well. Finally, the unforeseen delays will also give me an opportunity to record some of what this actually sounds like. For now, I'll be finishing up a few details on the overall construction, applying the finish, and adding some hardware. 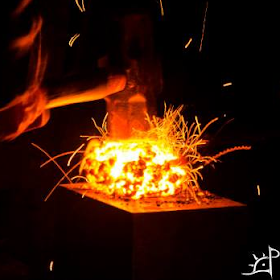 First up is cutting down the nut block to final size. The material is some sort of synthetic bone and is extremely hard. There was no good option for shaping it, so I eventually resorted to chisels and a bit of light file work to get it flush with the wood. With the ends to the width of the neck, I also needed to round over the far edge. 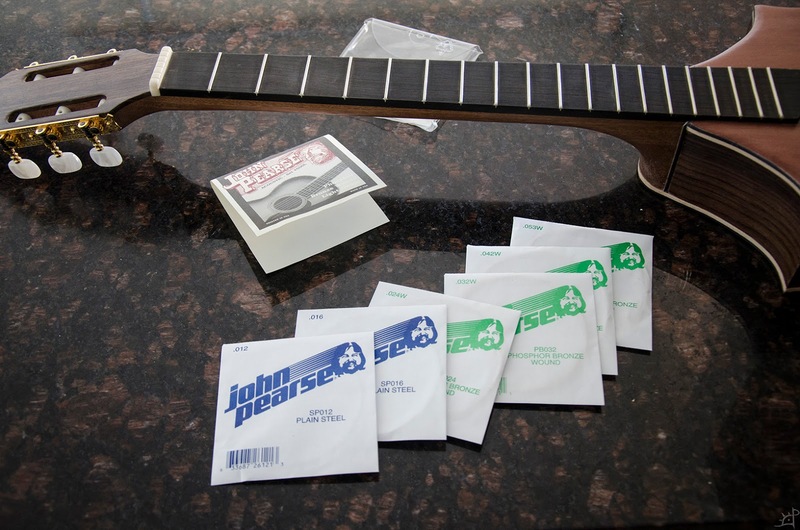 Since stringing and playing it a bit, I have since made some adjustments to the height of the nut and the depth of the strings with regard to the first fret. 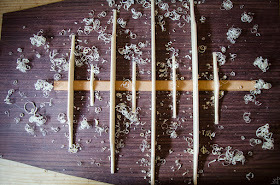 To string it, I needed to carve out six equally spaced grooves for the strings to sit in. Later on, I actually spread them out a little farther by reducing the empty space between the outermost strings and the edge of the nut. The first stringing revealed that they were too close together for it to be played without extreme difficulty in pressing strings without hitting the ones beside it. 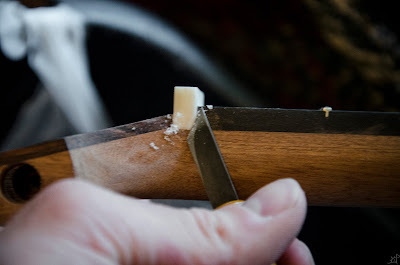 To establish a groove on the nut, I used the point of a triangular file, then opened it with a thin dovetail saw. 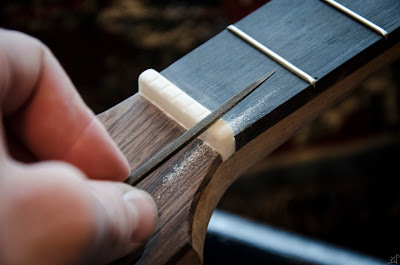 Having the corner that the string is pinned on through its tension needs to be on the fretboard side of the nut rather than the headboard side. 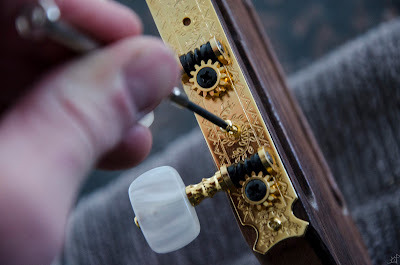 Without matching or even exceeding the angle of the headboard, the strings rattled quite a bit even when under full tension. Now that the last of the shaping is done (still rough on the depth of of the slots in the nut), it's time for finishing. Over the process of building this, I read somewhere that the fretboard is typically not finished with the same product as the rest of the wood. Not sure why or if this is even true, but I went with it. 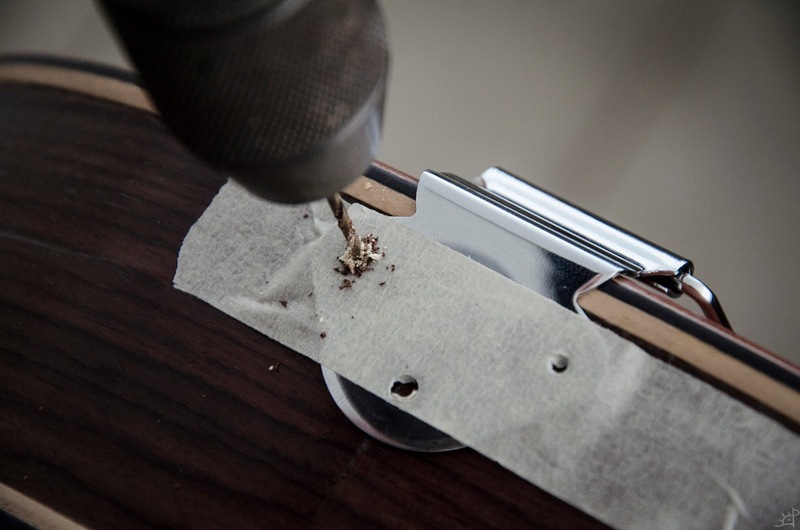 After all, it is easier to add more finish to plain wood than it would be to remove it later. So, I masked off the entire fretboard face (leaving the edges exposed to they will receive finish), making sure to press the tape into the corners of the frets so the finish does not wick into that small space. 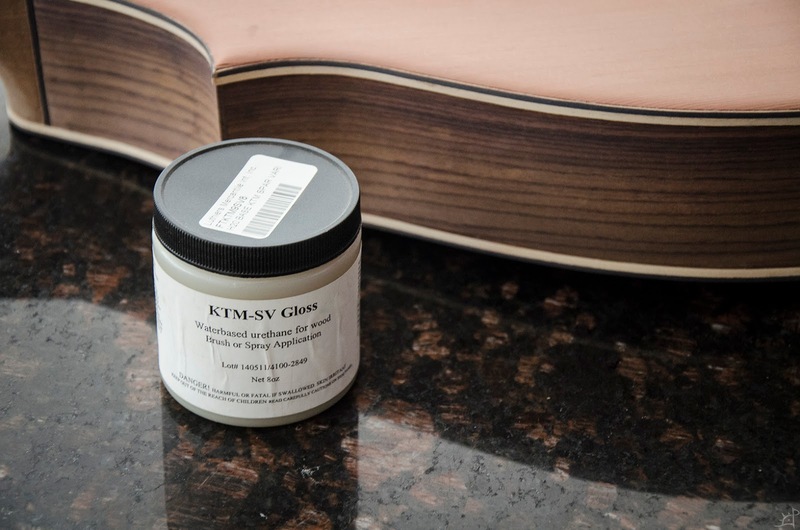 The finish I used is a semi gloss instrument varnish from Luthier Mercantile International. I expected this to be much more glossy than it actually turned out to be, but I think I actually like it better this way now that I've looked at it for a while. To apply it, I used a folded paper towel for the first few coats (for lack of anything else available) and eventually moved to a foam brush. I've found that the direction of the strokes greatly impacts how light reflects off the surface, and may end up going back and adding a few more to even things out. Between coats, I sanded the entire thing with 600 and 1200 grit sand paper. The first few coats were a bit rough, as the wood's grain variance tended to absorb the finish with a great variety. Once the entire surface was sealed, it grew easier and more consistent. All in all, I put on somewhere between 8 and 10 coats, but it's been so long now that I cannot entirely remember. 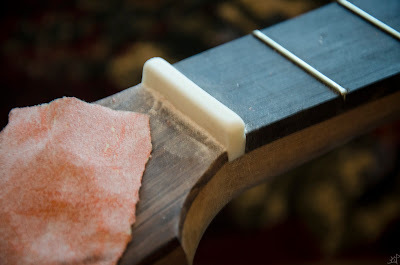 In spite of my efforts to prevent wicking into the frets, a bit of the finish found its way in there. A quick touch with chisels and sand paper brought it all back into order. Here we are with the worst of the capillary action. Fortunately it was not worse than this! 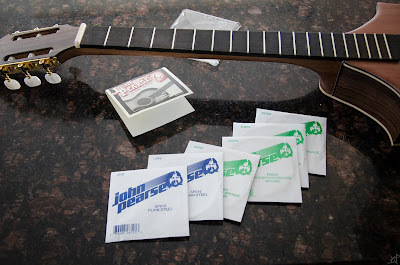 Now that it's all sealed and sanded, I can install the tuning pegs. For lack of an electric drill, I once again use the brace and egg beater. Although the screws are small, I do not want to risk cracking the sapele of the neck stock. A few pilot holes and we're in business. Screwing it into place was trickier than I expected. These little screw drivers are awful at having any sense of torque because the shaft is precious larger than the shank. In the end, I put a driver bit in the egg beater and screwed it in that way. Next on the agenda is the tailstock. I did not keep this one, but I did not take any pictures of installing the second one because the holes were more or less the same. 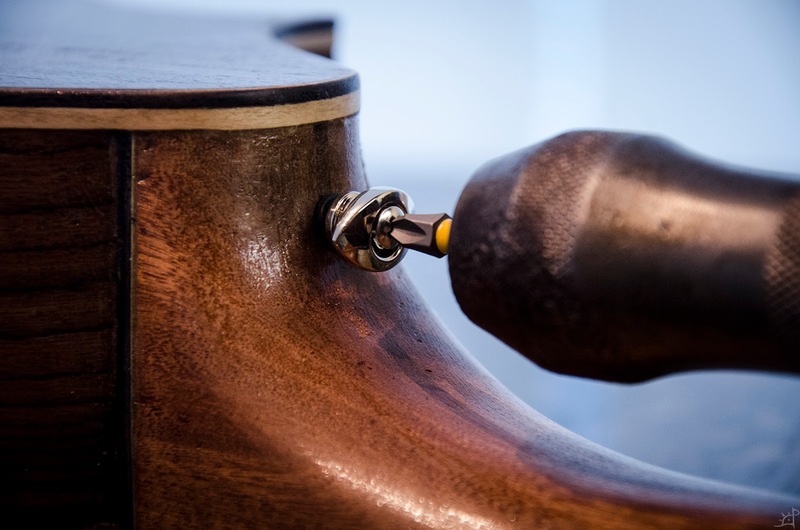 Aligning the tailstock with the strings was tricky because the heel of the instrument is not perfectly flat. As a result, moving the tail to the left actually twisted the string end to the right, to an extend, before swinging back around to the left. It took a lot of trial and error using thread as test 'strings' for alignment. 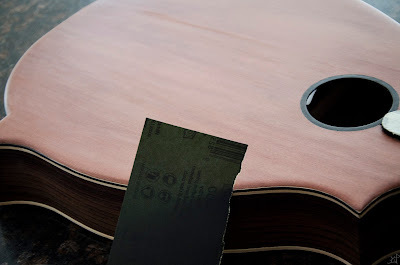 Once the outermost two sat evenly on the lowest edge of the fretboard, I taped the tailpiece in place and drilled some pilot holes. And now we're finally stringing it! Many, many months of work has led me here and I was a bit nervous that it would collapse under the tension (which spoiler, it did not). 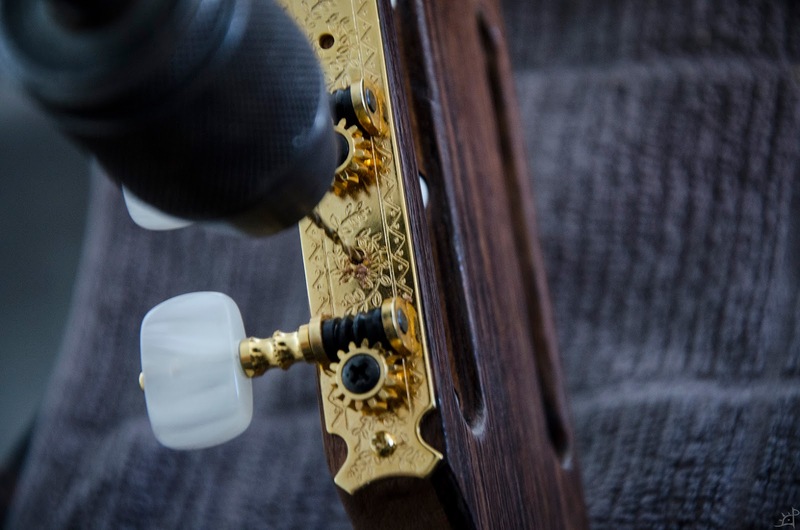 Stringing from thickest string to thinnest seemed the most logical approach to me, as those would require more tension on the neck to tune, thus pulling the other strings out of tune the most. It probably did not matter, as I went back and forth a bunch anyway as it settled. Since the tailstock was not in place when I did the rough filing on the nut, I had to finish them one at a time as I strung it. 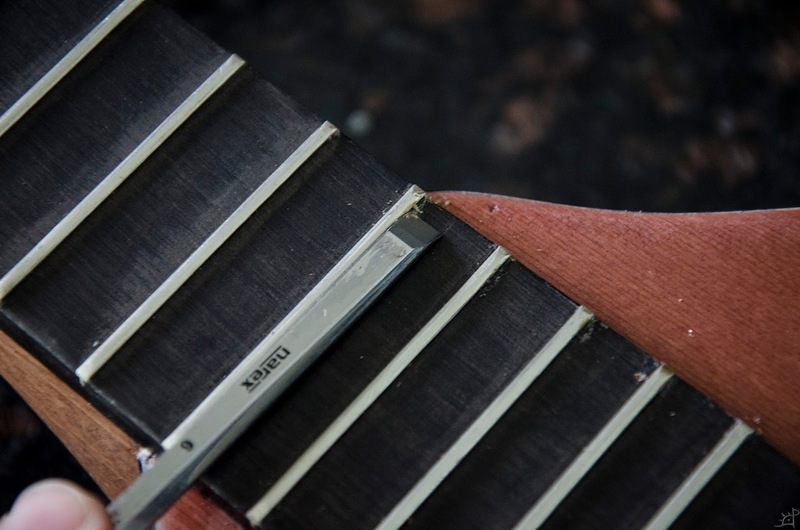 Ultimately, I was looking for an equal spacing for each string between the bottom of that string and the top of the first fret. This distance is important in determining how easy it is to play (how far down you need to press to engage a fret). Too much, and it is really difficult. 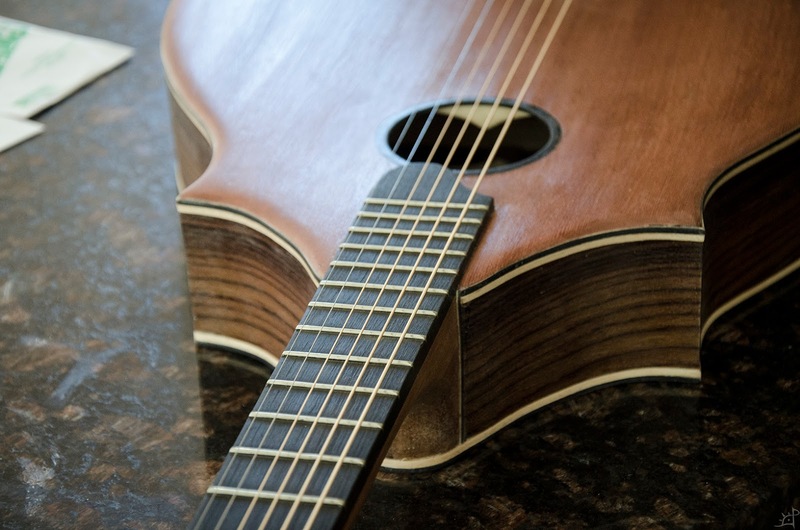 Too little, and the strings will probably rattle when strummed or plucked, which is no good. 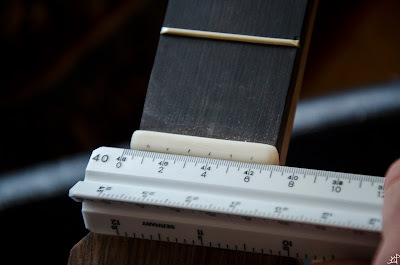 Some more adjusting, using the saw at an angle so the string is pinned by the corner on the right side of the picture (fret side) rather than the left (peg side, which would cause it to rattle). It's finally strung! Since I did this semi-concurrently with the stuff in the last post, I did not initially have the bridge made for this moment. 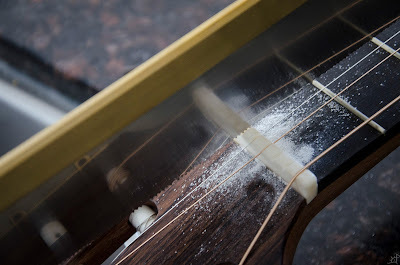 I was extremely worried that the entire thing was a horrific failure when it did not produce any sound when played beyond a faint death rattle of a whisper. The bridge resonance into the body is insanely important. The last piece of hardware for this post is the strap posts. After some design deliberation, I found these ones. They are tapered ovals as opposed to the more common circular posts, and I am quite fond of them. They make for a nice and secure hold for a strap without protruding very far from the body. 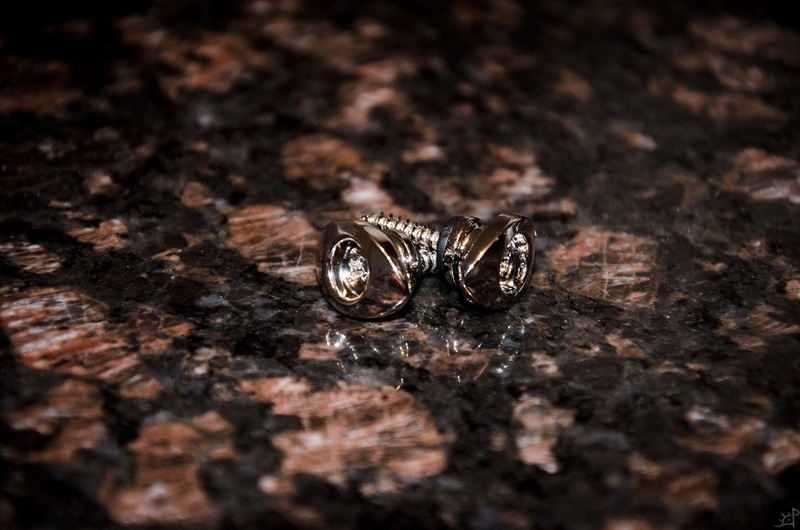 Installing them was a bit difficult, as the brace could only turn about 2/3 of the way before I had to lift it out of the screw and return it to the initial position. In the end, it all worked out. 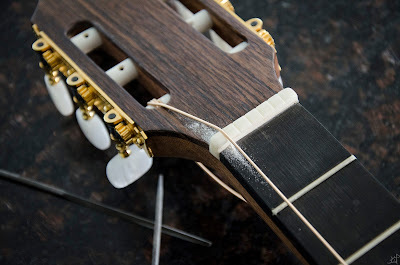 Here we are with the ebony/bone bridge in place. I have to do some work on this one, as it is a bit too tall. 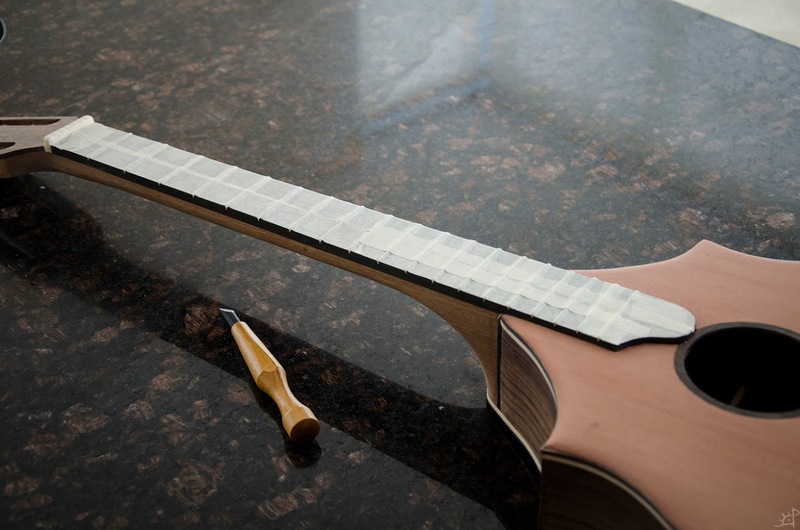 I did not realise how important it is to account for neck angle and bridge height when I began, so the strings still sit a bit far off the body end of the fretboard. 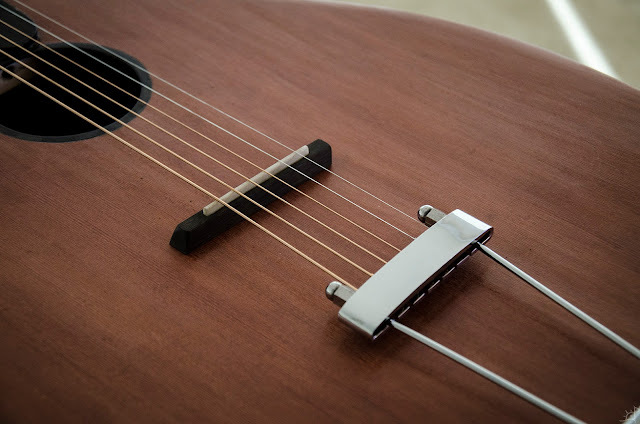 There is not much more I can do to lower that (lowering the bridge makes the strings slide and rattle because the tension angle is so small) but I have learned to adapt when playing it. 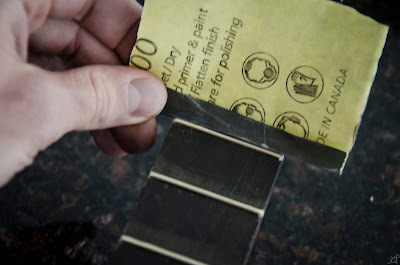 Next up, I'll hopefully have the fret markers and the internal pickups for connecting this to an amp. And, maybe then you'll finally be able to hear what it sounds like!